Quirky capture, Carin, with a serious message embedded in that sign! Carin, Carin, you’ve done it again! Made me spill my first cup of tea! 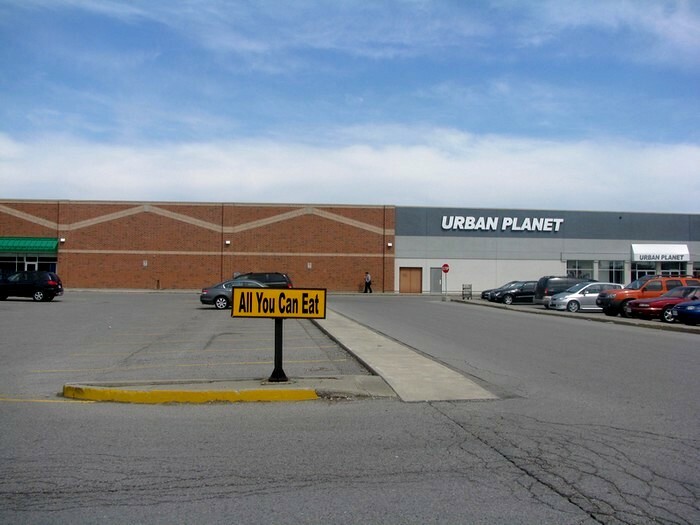 The picture — amusing at first glance — does also convey the bleakness of the “all you can eat” planet, though! Great shot. Thanks. This is a wonderful commentary Carin. I could stare at a picture like this for hours. So simple yet it says so much. Thanks, Allison. I love that you get it. A photo with a message — Carin, how do you do it? What first struck me was the bleakness of the scene. “All You Can Eat” but no glimpse of an appealing restaurant — just a stark parking lot (a la Joni Mitchell: “They paved paradise …”). And then the eye goes to the other sign. Priceless! Looks like a very unpopular restaurant seeing that the lot is empty. I’ll have a double order then! And once I figure out what that might be, I’ll get it to you! Thanks, Sheila. It was the All You Can Eat sign that initially caught my eye because it’s pretty much apropos of nothing. The background ‘appeared’ through the viewfinder. Love it when that happens.